The Broad ought to be considered immediately in the pantheon of contemporary art housings, not simply on the American landscape but in the world. The luxury of being able to appreciate the artistic pillage of a billionaire financier, who was aesthetically supported by a wife with decent taste, provides several unusual layers to savor about the works. For one thing, there is the pseudo-unlimited resources to acquire the art. Price is not an object, and thus the pursuit of growing the collection to the point it required its own splendorous exhibition for Mr. Broad’s fellow man to appreciate comes from genuineness, of authenticity. No doubt, as always, there is a degree of pretense, in an objective to be chic that may have had an impact on the absolute direction of the artistic repository. Nevertheless, this is an idiosyncratic collection; it clearly does not have the fingerprints of a MFA invisible hand guiding the Broads. There is clearly no one telling them what to think. They are pursuing this project by themselves, virtually for themselves, until it reaches the tipping point where humanity can relish in the swimming in the treasures. But that requires a qualification that this is indeed a treasure trove, and not another graveyard of rancid mudslinging by adolescently stunted artists who resonate with the similarly socially dysfunctional academics who gain chairmanships in the artistic world by succeeding, ironically, at the politics of bureaucratic administration of civil, i.e. private matters, such as those concerning taste. For, as I justified in Critique of the Last Man in Film, the task of art is not sufficiently to push the limits of the human imagination, but that is what good art accomplishes, and in doing so elevates civilization leading necessarily to higher civility – human tranquility. Tastefulness then is that which is aligned with directing man to be more correspondent to the Good, towards rational consistency with what his speckle of being is contingent upon. It is a spiritual practice which delivers something all too practical. Thusly, to bureaucratize such manners as taste is to defile it with the political, something necessarily worldly and profane and primal. It is no wonder there is such a vacuum of awesome, affirming, fine artistry underneath this plague, and that what is now commonly judged to be ‘good’ always is tinged and tainted with a judgment, a critique of society. If a man were to awaken from slumber and be received by the works that deck the halls and texts on contemporaneity, he would presume this is a cursed and cruel world, ruled by torturous social animals at constant aim toward enslaving themselves. In other words, a thoroughly anti-humanistic castigation. And yet, the glass can always be found half full despite the intensity at believing it to be sewage drainage. An artist that concentrates on bringing man down, to use his art as an instrument for political condemnation, is not attempting to render a representation of reality that is beautiful; rather it is a preservation of his judgment and critique as the beautiful one; his vision rather than the object of that vision. Of course, this subjectivity is the majesty of art; of its profoundness of genuflection onto others. Yet the beatific vision, the prophetic power, of art becomes subjugated to sorcery. Again, if an artist wishes to be political, he must deploy not imaginative power but reason. Discourse, not supra-rational persuasiveness. Otherwise art becomes an object of rhetoric, if not propaganda. It loses its purpose. Thus, we can appreciate a Mr. and Mrs. Broad for supporting a Jeff Koons. 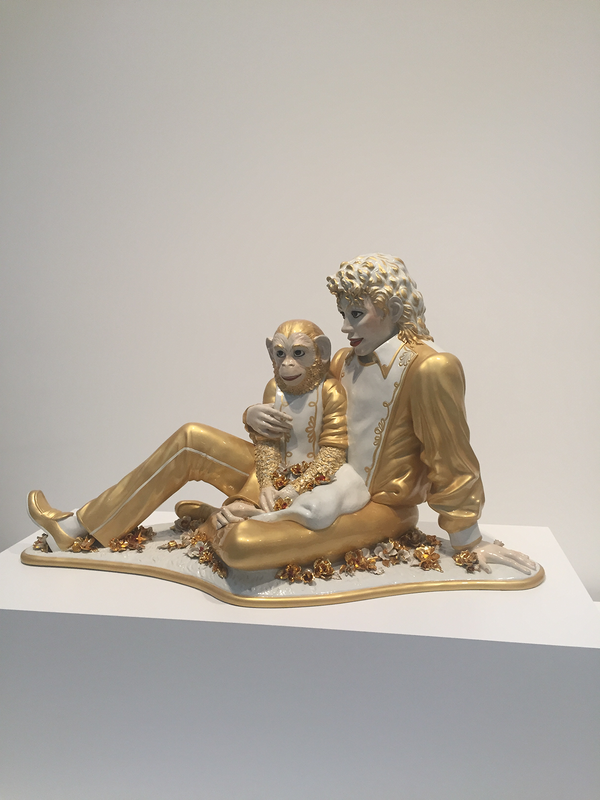 For championing even the hyper-absurd, cheeky appreciation of pop culture in jest with Michael Jackson and Bubbles (see image below) provides a positive zeal for the reality we inhabit. Yes, it is a derivation of an existing reality – it does not take on the odious burden of trying to bring forth Promethean fire. But it colors, positively, beauty into the little details of everyday life, and of an original take on an original phenomenon of the mass cultural object. We see, too, in this exhibition elaborate uninhibited artistry, sincerely the urgent needs of humanity being artistic. Feats of novelty for its very sake, but also ambitious crossroads of abstract symbolism with traditional fine artistry such as in Achilles and the Tortoise (see image below). It is too arcane an allusion to Zeno’s Paradox to be grasped so easily; what the portraiture is attempting to communicate may be not so much an ominousness towards the advancements of human technology, that arborist technique moves torpidly compared to rocket science and that suggests a degree of uncontrollability and hence risk in our profound admixture with applied science, but counter-intuitively, we may never be able to catch up to the divine order of nature with our own grand designs of mastery. Even though, self-effacingly, we have the delusion that we can come close to the incomprehensible complexity of nature – how clumsy a belief, that we can make something as organic and self-autonomous as a seedling and have it grow, self-sufficiently, in the soil toward vast heights! It’s a farce, indeed, and emblematic of man’s pride. Such artwork pierces into the nature of the human condition. This is not an easy feat. It is a judgment immemorial and universal. True, the meaning is hard to grasp, but easy to apprehend once digested. This cerebral challenge which has become a mainstay in contemporary art has often times not been married to something apolitical. There are social elements which are not necessarily political, after all. 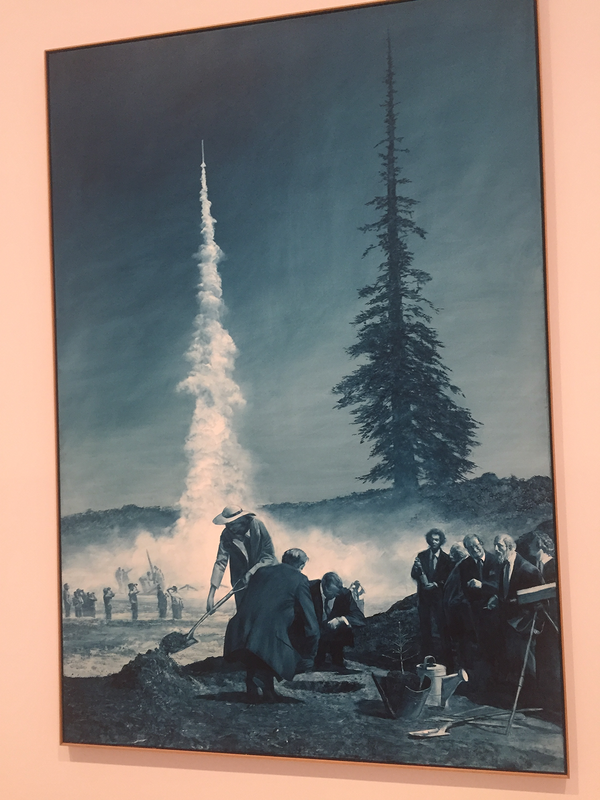 Most underappreciated about the entire experience at The Broad is the adulation and episteme of the art custodians ever watchful of tourists about to smear an artwork while taking a selfie. They are an absolute joy to converse with, and are voracious to talk art over helping little boys find the restroom (sometimes a necessarily evil decision.) How common would it be for instance, even in the art world, to discuss the merits of artistic manufacturing operations to assemble an artwork as somehow blemishing an artist’s creative vision? All in all, this is an exemplary contribution to the city of Los Angeles and to the art world.